When most people think of Mexico their thoughts usually go in one of two directions. It’s either a party destination like Cancun or Cabo San Lucas—or a scary place with drugs, crime and beheadings. My experience is much different. 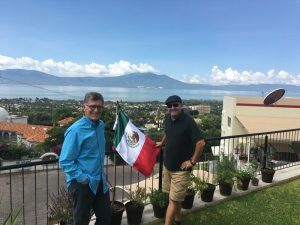 After traveling to over a dozen locations in this vast country, I am proof positive that Mexico offers a huge variety of pleasing destinations. 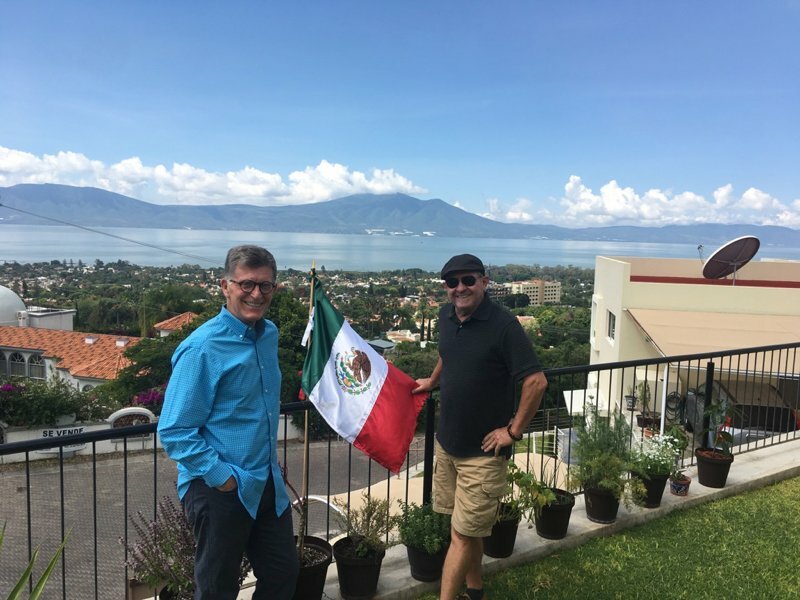 But until Thom and I visited Ajijic (pronounced Ah-hee-heek) this summer, we never really considered Mexico as a viable alternative to life in the U.S. Now having spent three weeks in this special community, I’ve discovered the top three reasons why so many people call it home. Whether you are looking to move or not, you might want to compare the benefits of Ajijic to where you live now. We sure are. 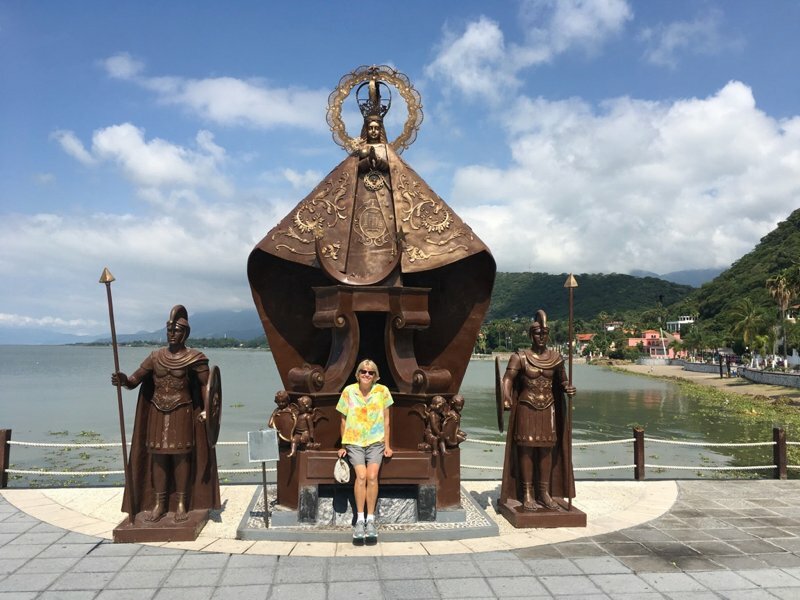 Tribute to Our Lady of Guadalupe on the pier at the city of Chapala. First off, with our travel experience as well as our real estate background, we would never suggest that you consider moving anywhere without spending a certain amount of time there beforehand. I think three weeks would be a bare minimum. 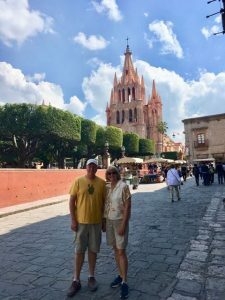 For example, we have spent weeks in Baja (both Rosarito and further south in Loreto), Ixtapa, San Miguel De Allende, Puebla, and Oaxaca. And while each of these towns has benefits, none fit us for long-term visiting or living. But that’s us. One of these towns might fit your needs perfectly, but the only way to find out is to spend time there. 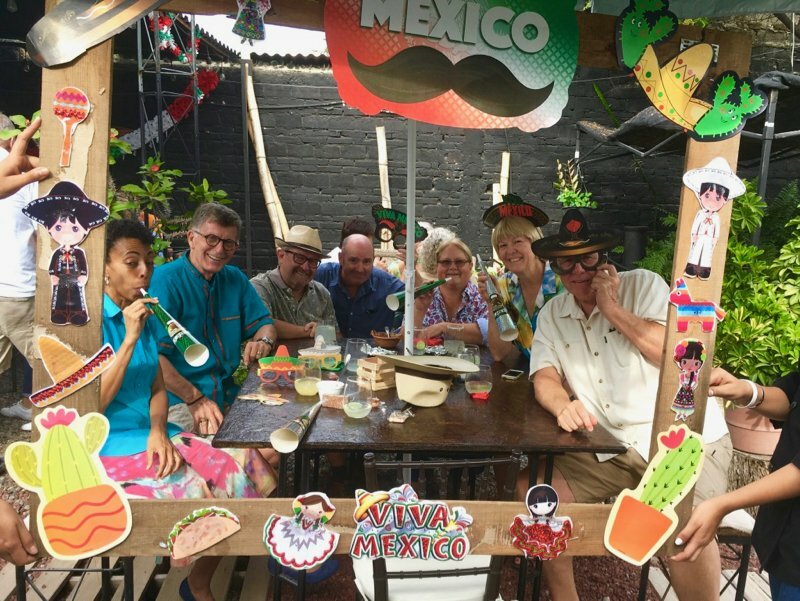 All new friends made in Ajijic celebrating Mexico! The third thing to do is to talk to people who are doing what you are considering. I can’t even imagine contemplating a move somewhere without talking to those who live there. I’m talking about both native locals and expats (U.S. Citizens now living in another country). While chances are good you will have more in common with the expats (at least to begin with) it is equally important to talk to the locals because they will help you gauge the attitude of those who have lived there for most of their lives and how they really feel about all these “newcomers.” Obviously, you want to feel welcome in any location where you hope to live. With that in mind, Thom and I spent a great deal of time during our three-week trip talking to people in and around Ajijic about why they moved to this location. And while there are certainly more than three reasons, these are the ones that every single person included in their conversations. #1 The weather. It’s true. If you Google weather in Ajijic you will discover that it considered one of the top two places in the world for the best weather year-round. At 5,100 feet, it not only experiences mild summer temperatures, but it’s proximity to the equator gives it a temperate winter as well. We first learned of Ajijic when seeking mild summers to offset our extremely hot temperatures in the desert southwest. July and August are considered their “rainy season” so everything is really green and it rained most nights we visited. The hottest month is May when temps reach into the 80s with humidity, but winters are mild with average temps in the low 70s. #2 The value. True again. We met over a dozen expats who were living in Ajijic because it is far more reasonable financially to live here, in such a beautiful location, than other desirable places in the U.S. For example, we rented an apartment for three weeks (considered a short-term rental, for $400 all-inclusive per week. The space featured a one-bedroom apartment of approximately 1,000 sq. 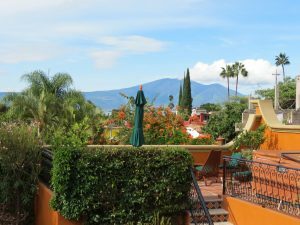 feet, had a full kitchen and bath, a king size bed, weekly maid service, all paper products, bottled water, and a beautiful patio overlooking the mountains and a tiny peek at the lake. We also had use of a solar-heated swimming pool across the street. And best of all, we were about a five-minute walk to the heart of downtown and dozens of restaurants and shops. Speaking of restaurants. Meals out are very inexpensive. 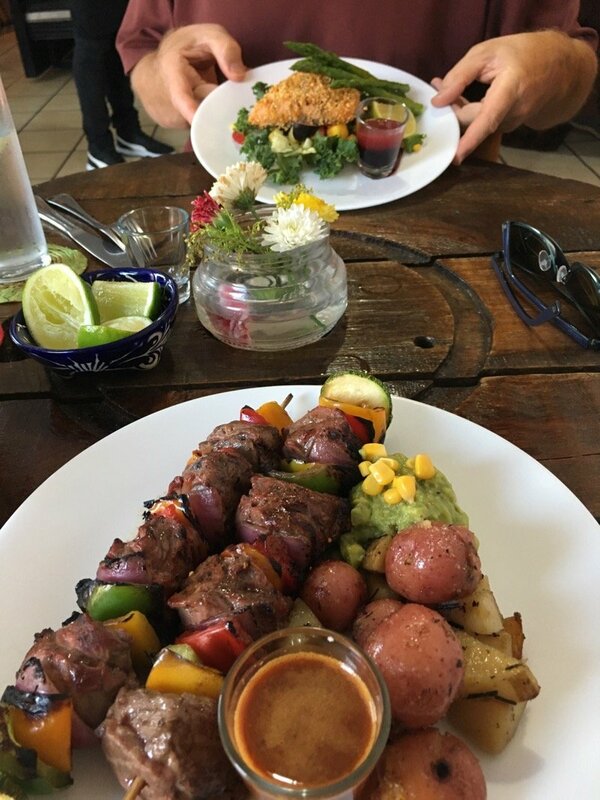 For two delicious continental dinner entrees, with two side salads and two “beverages,” you can eat extremely well for $35. This is at least half what a comparable restaurant in the U.S. would cost. 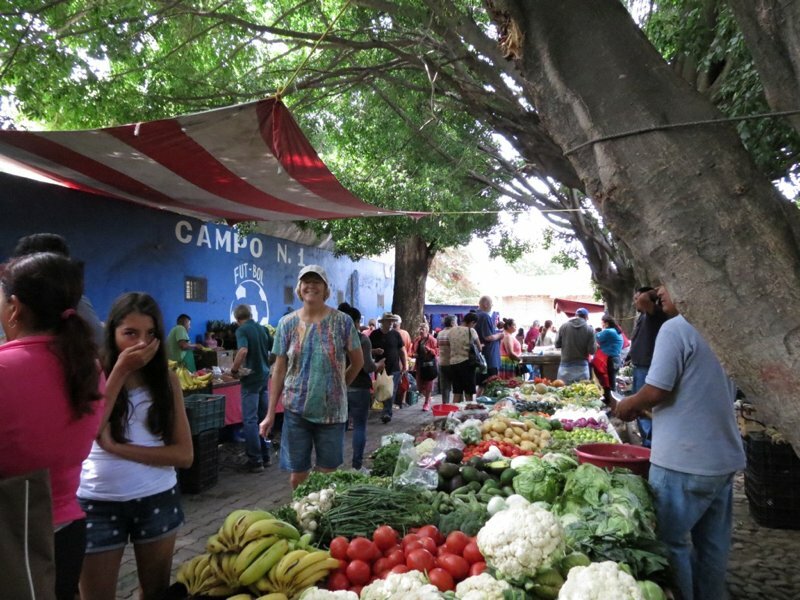 Food at the Farmer’s Market and local Mercado are also quite reasonable. #3 The People. This is where Ajijic really shines. 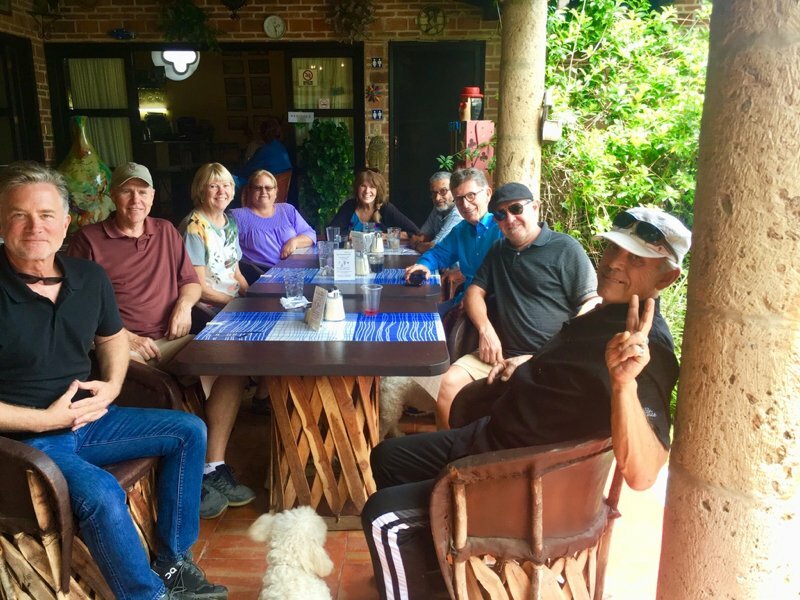 As I said before, we have traveled to many locations within Mexico (and around the planet) and something about this small-town laid-back community attracts extremely friendly people. About everyone was friendly, chatty and welcoming. And the native locals were also shyly-gracious although slightly reserved as their culture demands. Mark’s one acre of land where he plans to build. Before we went we knew one person who lived in Ajijic. A friend named Mark had visited a year before, bought property and moved there in May of this year. 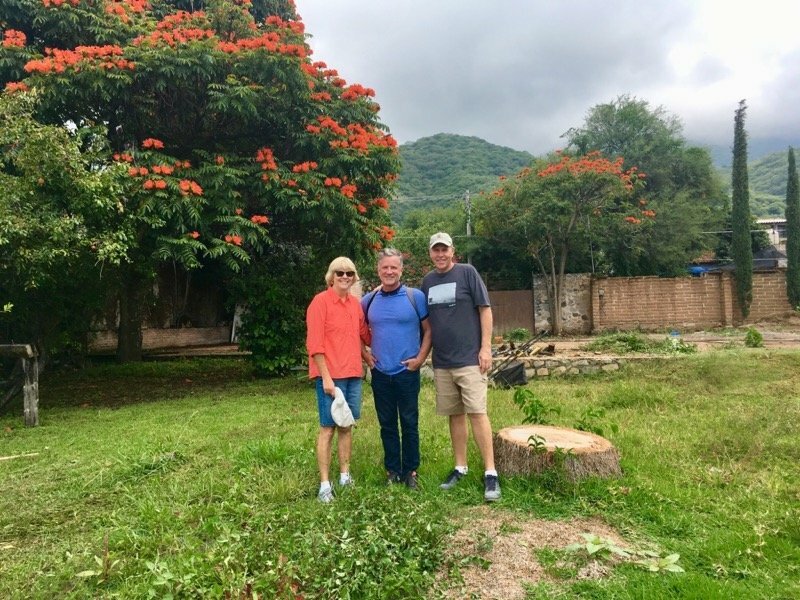 After reconnecting, Mark graciously showed us the property where he hopes to build a new home, another property he bought to rehab and resell, and the home he is renting in the meantime. There he is paying $800 a month (yes, a month!) for a two-bedroom, two bath home in a gated community. The view from Rick & Larry’s home. A friend on Facebook then introduced us to a couple who moved to Ajijic a year ago. We met Rick and his husband Larry for lunch and picked their brain about why they moved. Not only did they list the weather, the value and the people as important, they also picked Ajijic because they wanted to make a change in their lives. 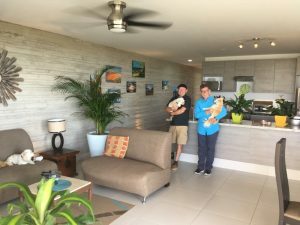 By moving there and renting a gorgeous contemporary 2-bedroom, 2-bath single-family home for $1,000 a month (plus utilities) they can easily afford to travel around the rest of Mexico and the world whenever they choose. Another couple we met spontaneously at a local TED Talk Discussion Group was Pat and her husband Jeremy. This adventurous couple met in Alaska over 20 years ago and then moved to Massachusetts for a time to be near Pat’s children. When looking to retire they considered their finances and decided to visit Ajijic (where they had friends) to see if it was an option. When a person they met over brunch told them to “Just do it,” they returned home, sold everything they had, and within five months found themselves calling Ajijic home. Pat and Jeremy in front of their home. Pat and Jeremy rent a small one-bedroom apartment a couple of blocks from the lake that includes utilities and has a shared swimming pool for $700 a month. Their goal is to live frugally on their Social Security and use their savings (if needed) for medical needs. Pat is 77 years old and she is also considering that at some point she may need to live in Assisted Care. In Ajijic, there are a number of assisted homes with caring and loving staff, as well as available doctors, for approximately $1,500 a month. While they no longer own a car, Jeremy is an avid bicycle rider and uses that for transportation. 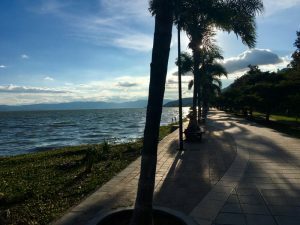 Did I mention that Lake Chapala has a bike lane connecting the towns? It is also extremely inexpensive to take a bus wherever you want to go. Other friends we met were Jason and his wife Laura who have been living in Ajijic after driving down from North Carolina (their timing was good!) They rent a 2-bed, 2-bath home with utilities in a nearby community for $750, which works because they are very active in local events. 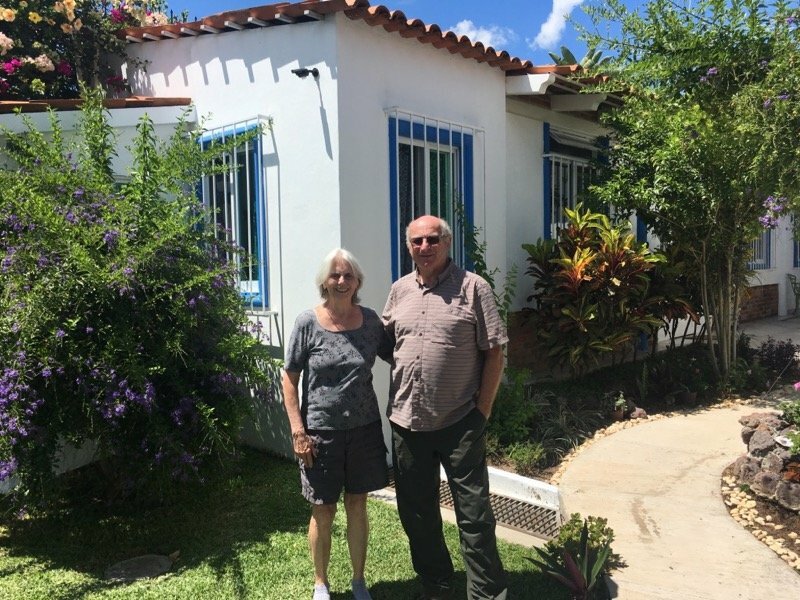 New friends Heidi and Raja also found a large four+-bedroom home in nearby San Juan Cosala with a huge patio with an amazing view and have their two large dogs for only $1,050. Did I mention nearly everyone has dogs? Besides couples, we met a number of single women living in Ajijic. I think the majority are drawn here by the low cost of living and the amazing support that can be found. 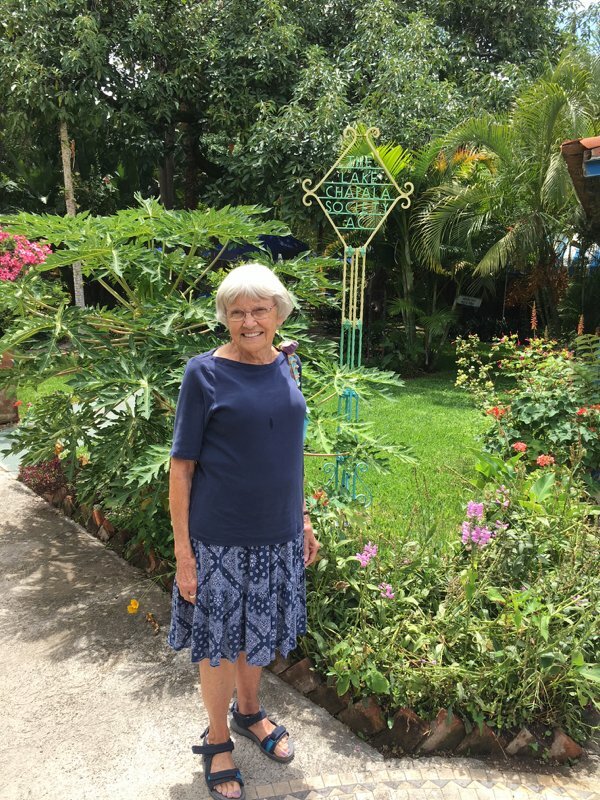 Susan Weeks (75) told me the reason she lives here after traveling the world and living in eight different countries is because of the kindness and compassion of the locals. 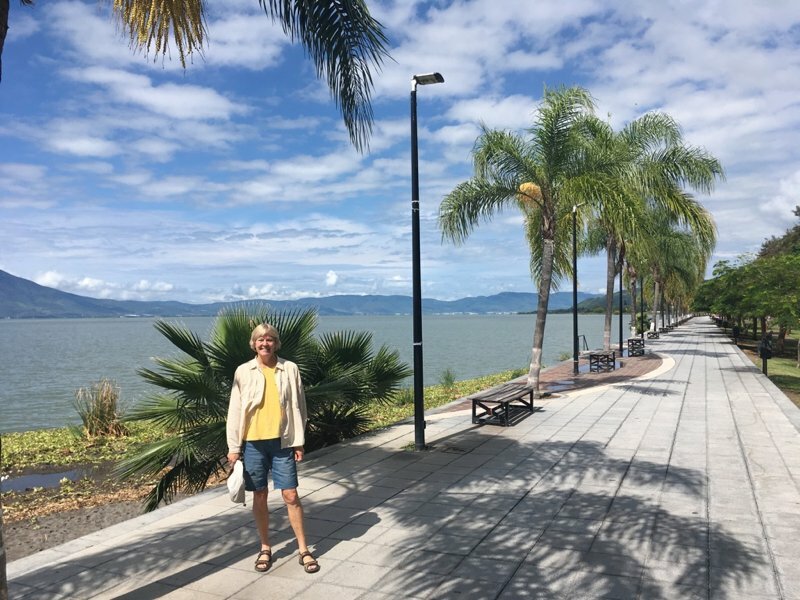 She is active and very involved in the Lake Chapala Society (LCS) which hosts the largest English library in Mexico, dozens of events for members to attend, and heavily invested in social and charities within the community. Susan’s “bus incident” story explains her decision very well. 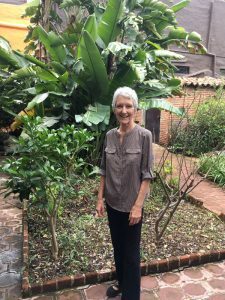 Susan rented an apartment and had been living in Ajijic for a very short time when she needed to run errands on the local bus. She left her apartment, walked across the street, and waited patiently for the bus to arrive. She felt fine. But when the bus came it was very crowded so she had to stand. And standing there she started feeling woozy and knew something was wrong. Although she was the only English-speaking person on the bus, instantly a spot opened up and she found herself seated. She is convinced everyone around her recognized that she was in distress. A few minutes later a group of people surrounding her on the bus began yelling at the bus driver to pull over and call an ambulance. And he did! Within minutes, the bus pulled over, and around eight people (men and women) helped her off the bus and found her a place to sit while waiting for the ambulance. Yes, these “strangers” who didn’t speak any English got off the bus with her and waited. When the ambulance arrived the driver and helper asked if she wanted to go to the hospital or home. By this time she felt she just needed to go home to her own bed. They took her there where her neighbors from downstairs helped her to her apartment as well as checked on her for two days. Within forty-eight hours Susan was perfectly fine. Oh, and by the way, there was no charge for the ambulance. She will never forget the kindness shown to her on that day. We met more people, of course. Women outnumber men almost two-to-one but without a doubt, they are fairly adventurous. 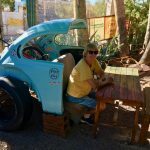 We met Molly at the local Sunday morning Open Circle at LCS where a variety of speakers share their knowledge every single week. 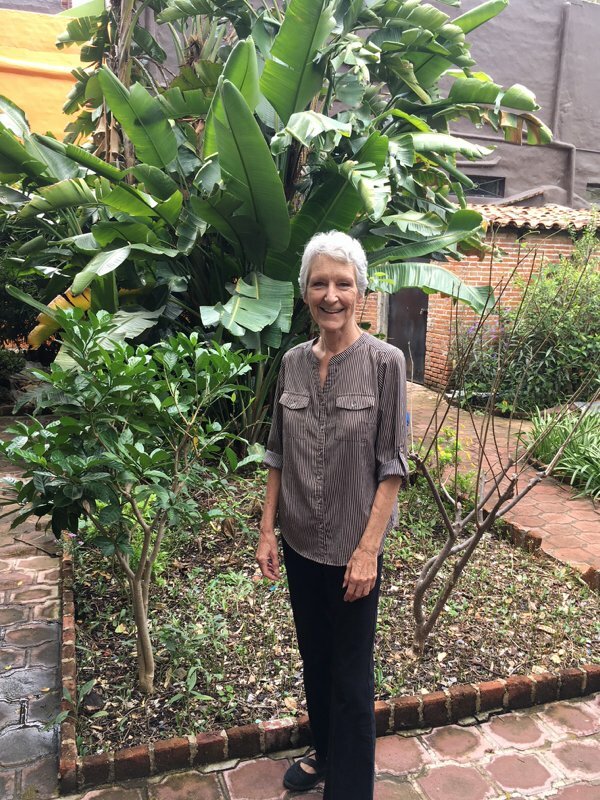 When I asked Molly, a feisty former nursing educator why she called Ajijic home for the last six years, she repeated what they all said: the weather, the value, and the people. But she was also quick to say that she didn’t want any more people coming because it was becoming much more crowded these days with so many Americans and Canadians now relocating. Molly admitted that it helped that she was in good health despite her nearly 80 years. And she strongly recommended that people visit before making the decision to move permanently. 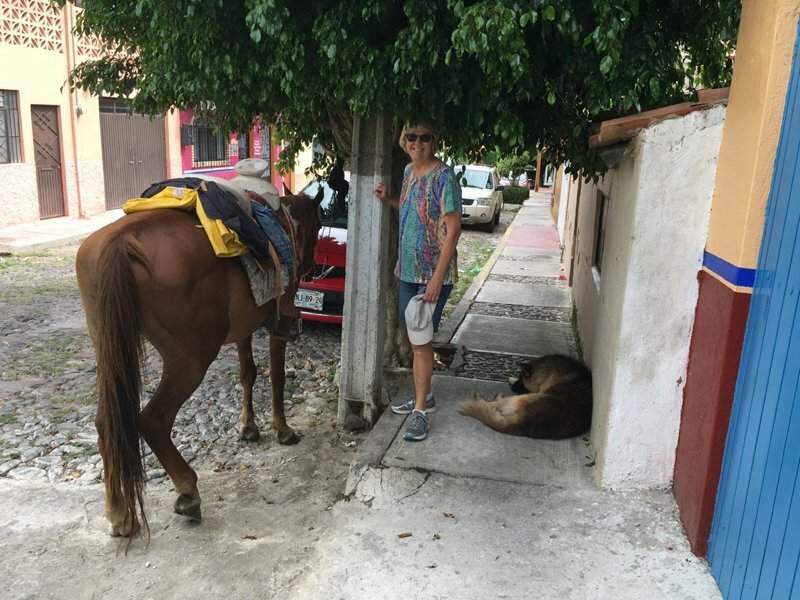 You never know what you’ll see on the streets of Ajijic–but everyone, people, dogs, and horses, are friendly! There’s more but I think you get the idea. I realize that Mexico or living in another country isn’t appealing to a lot of people. But make no mistake, there are thousands who believe it is more desirable to live there than the U.S. As for politics, I think it goes without saying that the vast majority of those who live in Mexico are of the liberal persuasion. And as for the downsides, Mexico is Mexico. There is poverty, and chaos, and corruption. If a person expects everything to be perfectly tidy—the people, the culture, the homes, and life in general—Mexico will not be a good choice. Walking the Malecon in Ajijic at sunset. Are we moving? No, we like where we live for many reasons so we aren’t looking to relocate at this time. But, with that said we are “sunbirds.” Like snowbirds, we are eager to spend time in other locations when our weather is less than optimal. Ajijic is now very high on our list. As always, finding a home and a community that best fits the needs (and the budget) of each individual a very SMART thing to do. Okay, your turn. 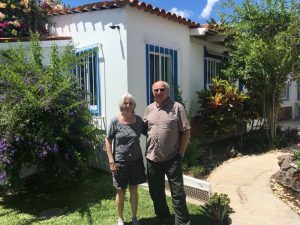 Have you considered living, retiring or spending time for an extended period in another country? What about Mexico? 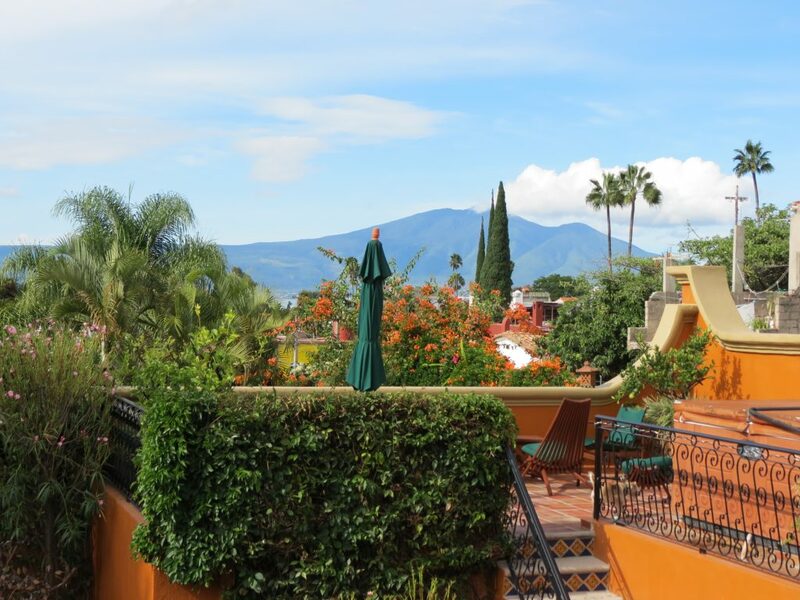 Do you think your current home has as many benefits as a place like Ajijic? Please share in the comment below. 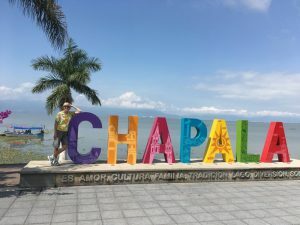 My wife and will are planning to move to Lake Chapala in two years. We have family in San Francisco and Minneapolis. For us, the good news is that less than an hour away is the Guadalajara airport. It has lots of direct flights to places like San Francisco and Minneapolis. We are also going to make sure we have 2 or 3 bedrooms. With no cost for lodging and a direct flight, we expect family will visit us and will also be able to afford to fly to the USA 2 to 4 times a year (with $$ from the savings on housing and living costs). I can easily imagine myself living in another country such as Mexico in retirement. For example, San Miguel de Allende comes to mind. I have not been to Ajijic, but it sounds very nice as well. Or, I can imagine moving there for 6 months of the year and staying at home for the other 6 months. However, I am pretty certain that I will not do either of these things. The reason is that I would not like to be so far away from my family. Moving to be closer to my grownup kids and my grandkids has been one of the great joys of retirement so far. However lovely a place somewhere else in the world is, I cannot imagine choosing to live so far away from my loved ones. So, for now, I will live at home and make occasional excursions to interesting places. Good post. Two of the attributes that drew me to Ajijic are transportation to family NOB (also points around the world) and the proximity of a huge city with all its amenities and resources. 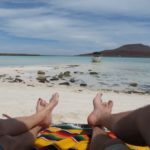 I too have spent time in other interior towns/cities around Mexico – the coast is too hot for daily life for me – but decided on Ajijic also for the reasons you listed. Another major benefit for newbies especially is the prevalence of English. Many expats speak barely a word of Spanish, which I find odd at best, and function with little problem. I tried to send a comment earlier regarding not a word in your blog about the very active entertainment scene here at Lakeside! I have been writing a weekly newsletter for over 5 years now and it has grown to about 20 pages+ a week (at no charge to anybody). Some of the hotels and B’n’B’s are making it available to their guests. This is something the short term visitor rarely finds out about but it goes on 7 nights a week and is not late… most are over by 10 PM or before! Some great musicians locally as well as many from the US and Canada. There is all kinds of music and lots of dancing. I send 1,800+ e-mails every week advising when the newsletter is posted on 4 web sites (including Gary Jones’ mentioned in an earlier comment. You also mentioned you are in Real Estate… my wife and I were too back in Canada for over 30 years and she (younger than I) is enjoying her continuing career down here. The market is not booming here, it just took longer to start the recovery. People that had been renting their properties because of lower prices have found the low priced homes are gone and they can now sell their properties… many long term tenants have found this out. You can still buy a very nice home here for $250,000 to $300,000 USD in very good areas… not much in nice homes up north for those prices. 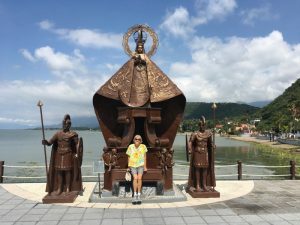 Another great thing here but unknown to many short term visitors is that there are both the Canadian and American Legions here, the Rotary Club has a group in Ajijic, Chapala and Jocotepec, Freemasons, Shriners along with an array of other volunteer organizations. I spent several holidays in Mexico during the 1980s and early 1990s, mostly in Bara de Navidad. It was wonderful at that time, and I could see it would catch on as a great place to visit, given the advantages you list, which have remained the same. We considered retiring there someday, but the extreme poverty of the people troubled me a great deal, so we scrapped the idea. I was always amazed at the generosity and friendliness of the people, given that we had comparatively so much more than they did, and the inequities were hard to ignore. Seems that not much has changed, regrettably. 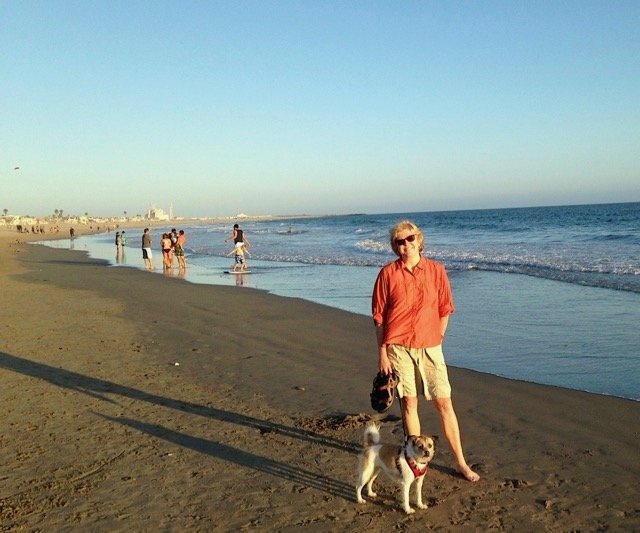 Thanks, Kathy, for bringing the possibilities of living in other places to our attention. Plus, in many cases, where groups of expats find themselves there is nearly always groups formed to help the local people and children in appropriate ways. Actually, from what I can tell and from the locals we spoke to, most are quite happy with all the expats now living locally. It has helped to raise the economy and provide many more jobs that weren’t there before. And we even spoke to some who had lived in the U.S. (legally and not) and most were happy to be back in their home country surrounded by family and friends and focused on what they consider to be much more important than grinding out a job to buy a lot of stuff. Yes, I guess you could say they have “rightsized” too. I agree that inequalities in civil rights and possibilities are important….but inequalities in finances are relative to each of us. Remember, if the whole world lived like most U.S. Citizens…we would need five planets to provide the resources. That always keeps things in perspective for me. Oops, my bad. Of course Mexico is America. I mean, I’ll stick with the U. S.
Thanks for the suggestion, but I’ll stick with America. The ambulance was not really free. It was a Cruz Roja, or Red Cross ambulance and the community supports Cruz Roja through donations and its very modest fees. Please go to the Chapala Cruz Roja offuce and make a generous donation. Excellent post, Kathy. You captured the joys of living here very well. If you into sharing your article I would welcome you as a guest columnist on my website. I fell in love with Ajijic the day I arrived. My initial plan was to spend six months here checking it out, primarily because I had two disastrous experiences before with Panama and Ecuador, so I was cautious. No need for that. I returned to Canada to apply for my temporal and got it when I returned to paradise. Very happy here. That’s great, Kathy. Your article is very positive but it also couldn’t come at a better time. This week’s Guadalajara Reporter which I compare to the National Enquirer is chocked full of bad news that certainly doesn’t help our area. There’s a story about a shooting in Jocotepec, not far from Ajijic, where three men were killed. They use the horrible storyline “the wave of a criminal violence that has plagued the Guadalajara metro area throughout this year appears to be spreading to the normally placid shores of Lake Chapala”. A very isolated incident and hardly a spread of violence. Certainly not great for our tourism. I can get everything I need from your article. Maybe you could send me a proper photo to use as a guest columnist. Gracias. I’m looking to explore this as a real possiblity next spring when I will be done subsidizing college educations and finally be an empty nester. I was glad to see there are many single women involved in the group and that the opportunity to rent rather than buy exists. I really hate to fly (especially on anything smaller than a giant plane), but my kids life in Texas so my visiting commute wold not be as bad as for some others. I am curious about the medical situation, did you discuss any of that in depth. I do have a supplemental insurance that covers overseas medical, but would I need it? Hi Barb. As far as getting there…you can actually drive there…especially from TX. We might do that from So. California because we wouldn’t want us to fly with our dog. It is a fairly straightforward 2-day drive on mostly a toll road from most locations along the border. Sounds really inviting. Following all your posts, (of course), high lighting the food and prices and your pool and accommodations, yes inviting! With climate change I am happy where I am at, Portland is less rainy and less chilly in the winter and hotter in the summer but not too hot. Great post, Kathy. I enjoyed reading the personal stories and actual prices of rent and food and such. One of the reasons we hope to spent some of the winter in Mexico is to cut down our spending. We look forward to $1 tacos and other inexpensive street food, meals and drinks. Not quite in the $35 range, but definitely much cheaper than in the US, where we rarely go out for that reason. Hi Liesbet! I know that question doesn’t really apply to you because as you say, you’ve lived all sorts of places in your relatively short life. 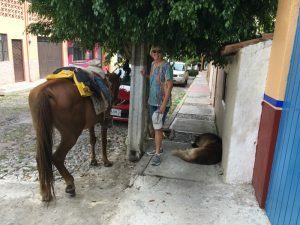 We actually met another woman who was doing a house sit in Ajijic while we were there–but she was charging for it!!!! She didn’t look too happy when we told her our Kloe was at home with a pet sitter who was staying in our house for FREE for 3 weeks while we were galavanting in Mexico. BTW our sitters turned out to be fantastic and we’ve already asked them if they will come back next summer as well. I enjoyed your writeup and photos, Kathy. I’m not brave enough to go but live vicariously through your adventures! Keep ’em coming. We aren’t looking to relocate permanently, but I think in a couple of years we will be looking to spend significant amounts of time during the winters in a more pleasant climate. This sounds like a great place to spend a nice month or two in the winter! 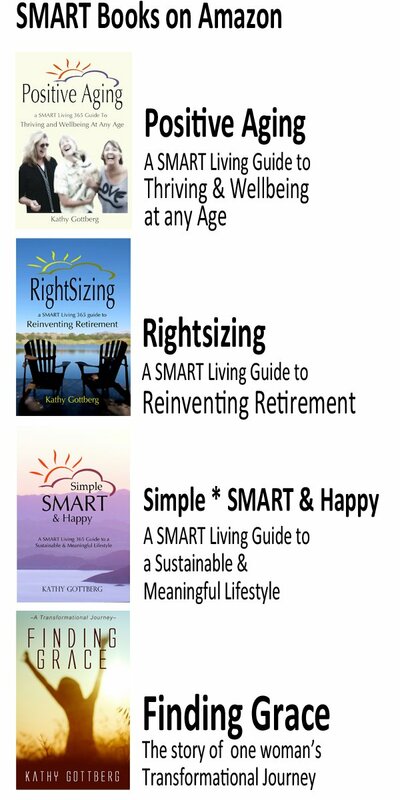 Kathy – what a great post! Your vacation sounds lovely – despite the ‘struggles’ you shared in your last post. I appreciate the way you laid out the three important aspects to consider. I might add that ‘food’ is important. Having lived in other countries, I know that those who could not adjust to the food choices, could not stay long. 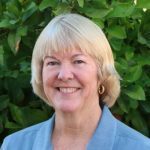 Hi, Kathy – Thank you for this informative and interesting post. I hadn’t headr of Ajijic before you mentioned that you were going there. I have now added it to our list of potential places to consider visiting. I look forward to hearing more about it when we meet together in person shortly. See you then!